During an interview on Rachel Maddow, Thursday evening (4-01-10), this tweet appeared: "We did it. No murders for the past calendar month". For the first time in 44 years, the city of Newark, NJ went for 30 days with no murders. This is in the city which Money Magazine, in 1996, labelled a "Most Dangerous City". This is the city for which Cory Booker, D-Newark, is completing his first term as mayor. This is the city in which the crime rate has dropped 20% since 1997. 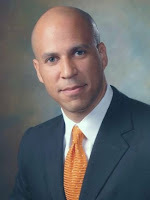 Booker is a Rhodes Scholar, a Yale law school graduate. He is "clean and articulate" :-), somewhat hyper, a dreamer grounded in the pragmatic next step. One way or another, you need to follow this guy if you wish to join the effort to solve all the world's problems.